Takes about 45 minutes. 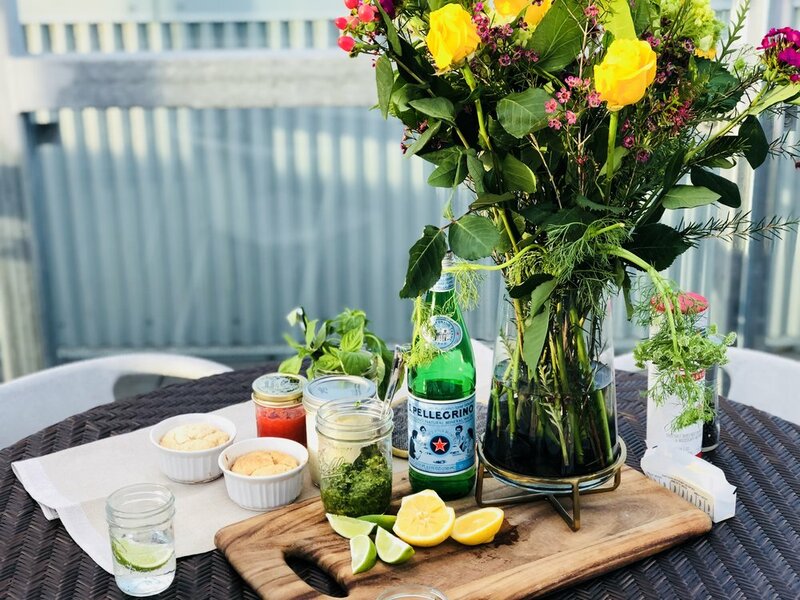 Can be made on the grill or in the oven. Make the salsa verde: combine ingredients in the food processor, salt and pepper to taste. Lay out a large sheet of parchment paper. Add potatoes, some pads of putter, and salsa verde. 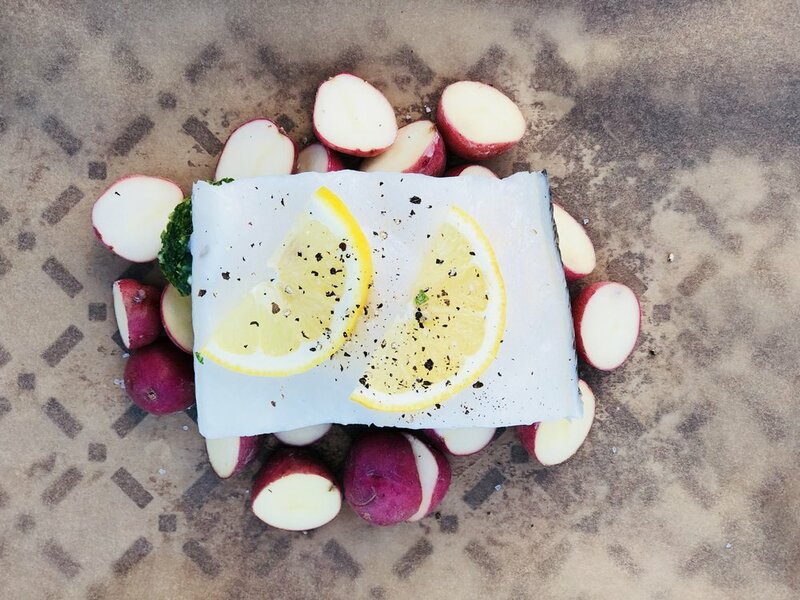 Place the sea bass on top of the potatoes, then add lemon slices and salt and pepper. Bring the paper up to meet in the middle. Pinching with your fingers, roll it down until it is snug and tuck the sides underneath the fish. Place the wrapped fish on a tray and cook at 400 degrees for 20 minutes. The paper won't burn (sometimes I haven't even used the tray). 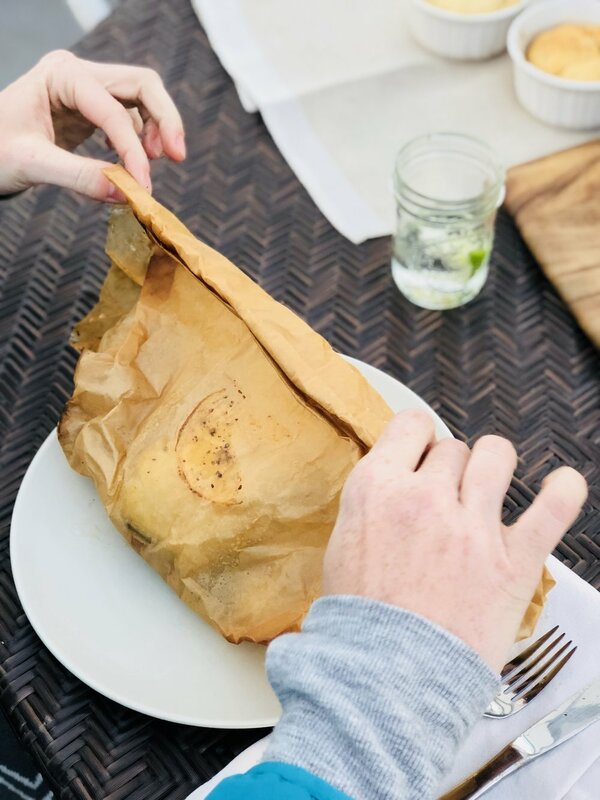 Place the en papillote straight on the plates and let your guests unwrap their own. Have extra butter, lemon, and salsa verde on hand for topping. The steamed fish keeps all of the juices and flavors in and bonus: no mess! You can use any kind of fish, sea bass is just my favorite. 1/2 pound per person is plenty (fish is lighter than game). Don't worry about the paper burning, it might get a bit charred in some spots but the steam will keep it from burning. I've even put this straight on the grill without a grill tray. I do recommend putting the extra time in to halve or quarter the potatoes so they will be cooked through without over doing the fish.